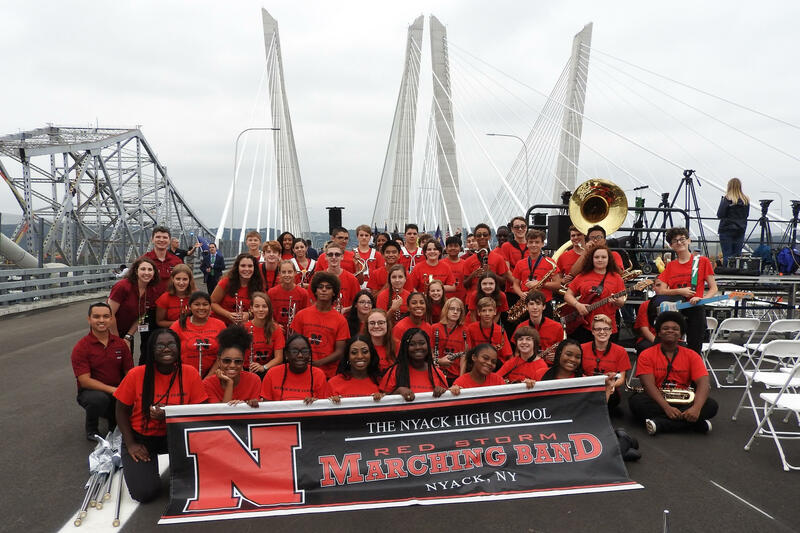 On Friday September 7, the Nyack High School Marching Band participated in the ceremonial opening of the southern span of the new bridge connecting Nyack and Tarrytown. The group was bused out to the main span where organizers had erected an entire stage and seating area. From there, the band entertained excited onlookers, performing selections from their field show repertoire. During the ceremony, students were able to witness speeches by Governor Andrew Cuomo and former Secretary of State Hillary Clinton, who acknowledged the collaborative effort that went into the construction of one of the largest cable-stayed bridge spans in the country. After the unveiling of the new commemorative plaque, the band erupted in song as the ribbon was cut and the governor drove FDR’s 1932 Packard across the span. The award-winning Nyack Red Storm Marching Band is a product of the Nyack district’s music program.